Few cuisines manage to build in as much flavor to grilled chicken as Thai cuisine. These recipes showcase the classic combinations taste and flavor you get from Thai cooking. If grilling is not an option, the dishes can be cooked in the oven. This classic grilled chicken recipe is truly bursting with flavor. Marinated in a garlicky sweet and sour sauce, the chicken pieces are then easily grilled (or oven-baked) to perfection. Add the special homemade Thai sauce as either a dipping sauce or a glaze and this dish will be the star of your dinner or lunch party. There's standard satay and then there's Thai chicken satay. If you've never had authentic Thai satay, you're going to be blown away by the succulent taste of this satay recipe. Strips of chicken (or beef) are marinated in a special Thai paste, then skewered and grilled (or broiled in the oven). The chicken is served with homemade peanut sauce for the ultimate taste sensation. These chicken skewers are popular with kids and make a great party food. 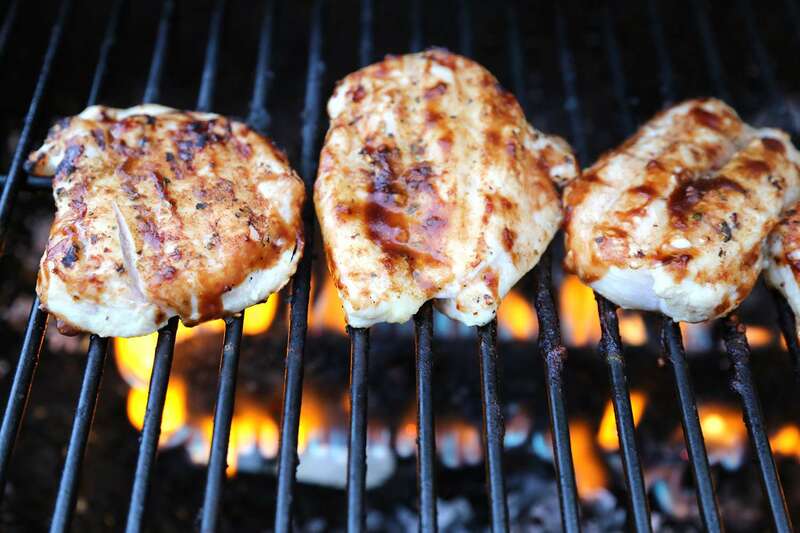 If you like good grilled chicken but not the work involved in making it, give this recipe a try. A special marinade imbues the chicken with taste and gives it a beautiful reddish barbecue color. Serve the chicken with a quintessentially Thai sauce that is super-easy to make (no cooking involved) and gives your chicken that extra hit of flavor. This is a great recipe to make for everyday eating, but just as perfect for a dinner party. This Thai grilled chicken salad with lemongrass-coriander dressing will thrill your taste buds. It starts with strips of chicken breast marinated in a garlic-pepper sauce. The chicken is then either grilled on your barbecue or cooked in the oven. Place the cooked chicken over a bed of summer greens that have been tossed in a lemongrass-coriander-lime dressing, top with a sprinkling of fresh basil, and you have a complete meal that is utterly satisfying and delicious. Thai mango grilled chicken is a delight to make and to eat. A twist on traditional mango chicken, this barbecue version is equally delicious and just as spicy-sweet. Simply toss a ripe mango (or use frozen mango) plus some key Thai ingredients into your blender to make a delicious mango sauce that works as both the marinade and a dipping sauce. Serve this dish with rice and you'll make everyone happy at dinner. This chicken wings recipe is very easy to make and the taste is superb. Even your kids will go crazy for these chicken wings, which turn out naturally glazed with a garlicky and slightly sweet sauce. Barbecue them outdoors, or bake them in your oven. Either way, they turn out fabulous. Chicken wings are always a popular choice for dinner, whether during the week or on lazy weekends. For an easier version of Thai chicken satay that is authentic, juicy, and flavorful, look no further. The chicken can be made in the oven or the grill. Serve it with easy peanut sauce and rice on the side, or just enjoy straight off the stick. If you're a grilled chicken fan, try this Thai lemongrass grilled chicken recipe. The chicken is infused with a lemongrass-garlic-ginger marinade then easily grilled to perfection. Serve it with a lemongrass-sweet chili sauce on the side. This is an easier, step-by-step version of the classic Thai chicken satay recipe. Follow these simple instructions for the best chicken satay.